Lightly film the bottom of a large pot with the oil. Add the onion and sauté on low to medium heat until the onion becomes slightly translucent and golden brown on the edges. Add the garlic and cook until fragrant. Add the chopped zucchini and mushrooms. Season with the salt, black pepper, cumin and cayenne. (If you like your chili extra mild, start with a smaller amount of cayenne and work your way up. 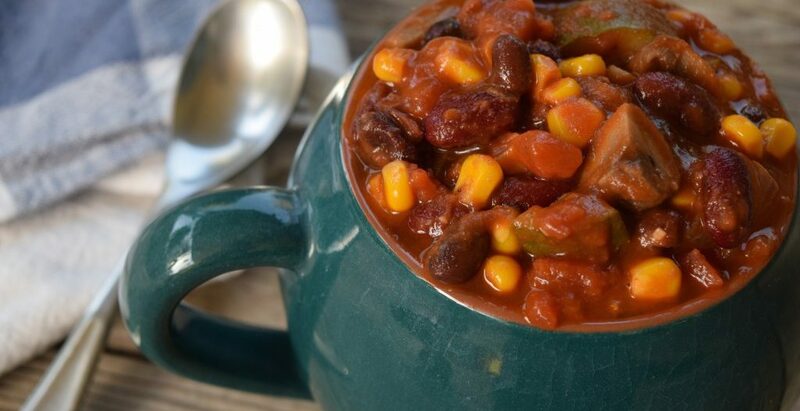 One teaspoon of cayenne will give this chili “medium” heat). Add all of the canned ingredients. Stir in the water and simmer on low heat for 45 minutes to 1 hour, stirring every 10 minutes or as needed to make sure nothing sticks to the bottom of the pot. Taste to see if it’s as spicy as you like your chili—if not, adjust as needed.